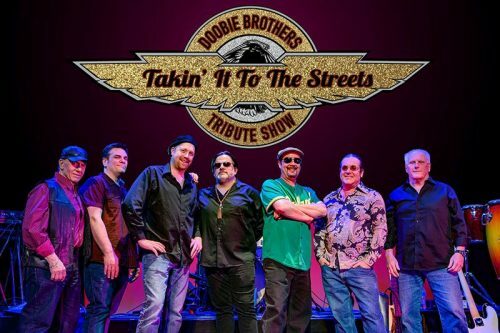 Takin’ It To The Streets is the ultimate Doobie Brothers tribute show. This incredible concert performance covers all of The Doobie’s great hits and an occasional deep track or two with stunning accuracy. You’ll hear Long Train Runnin’, China Grove, Listen To The Music, Takin’ It To The Streets, What A Fool Believes, Rockin’ Down The Highway, Minute By Minute, Black Water and many more! With amazing vocal skill and top notch musicianship, Takin’ It To The Streets brings it night after night, show after show. The Doobie Brothers concert experience doesn’t get any better than Takin’ It To The Streets.